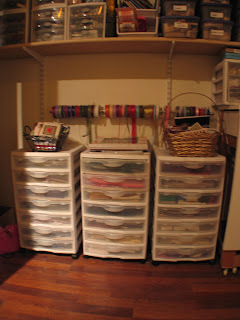 Today's entry at Scrapscene is all about ribbon storage, worth a look! In Julie's words: While we were building our house, one of the things I desperately wanted was a place to create. 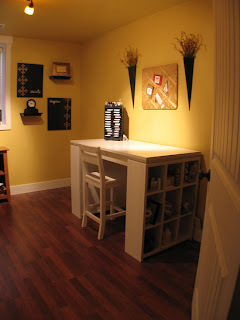 For 7 plus years I would haul stuff up from my laundry room to the dining room table and transform the middle of my home into "a stamping disaster area." When we built our new home, I claimed one of the extra bedrooms. My goal was to create a space that could contain most of my craft things in a closet. That way, if company came, I could close the doors and not have a huge mess staring me in the face. My closet it ten feet long by 2 plus feet wide. It's perfect for all my stacked storage. I've taken plastic bins -shoe box size from Steralite - and have categorized them based on stamping categories - flowers, backgrounds, phrases, etc. The rolling carts inside the closet are perfect to store 12 by 12 papers. They fit inside perfectly and when you slide out a drawer, they have lids so that you could take a stack of paper with you to a card making party! 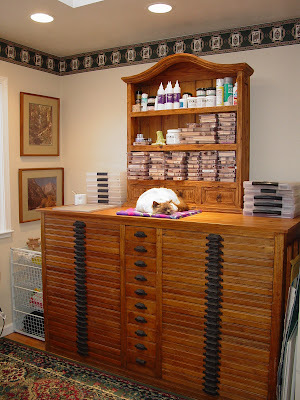 I've also used some of the drawers to store punches, envelopes and ink pads. I mounted a small cafe curtain rod on the wall and that houses most of my ribbon. I simply strung all the rolls on the rod and they can dangle easily. I can grab the amount of ribbon I want without taking the roll of ribbon off the rod. 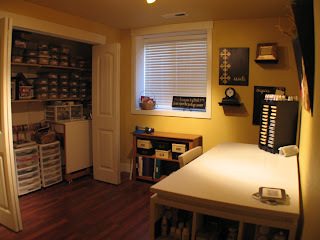 The desk that is my work space is one that has cubbies on both sides which are perfect for storing embellishments. I have my paper flowers, more ribbon, markers etc. in all of these cubbies. I even used one cube for my acrylic blocks. On my desk is my ink pad storage system. It is so nice having all my ink pads at arms reach! On the top of this in pad storage system are spots for my re-inkers and bottles of glitter glue. 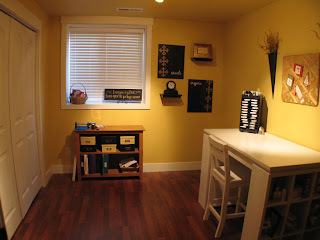 You can see - it's not a huge space (roughly 120 square feet) but the closet is key! On the other side of the entrance is another smaller closet that houses all my yarn, patterns and needles for my other passion - KNITTING! You can check Julie's blog here. 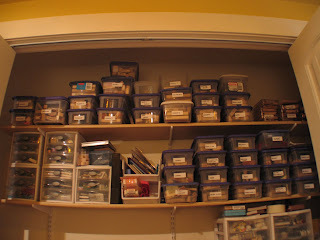 I have put up a poll on the right hand side where you can vote about the type of crafty storage you prefer: pretty and decorative, practical and convenient or recycling other furniture that you had or given, because crafty storage can be practical and pretty I suppose I added the all of the above answer. 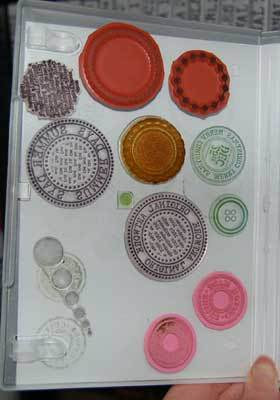 For more info on Tim Holtz and his products click here. 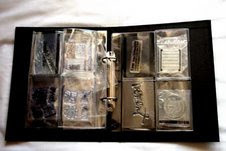 When Kim heard the idea of using CD covers to store clear and unmounted stamps, Kim figured they wouldn't hold enough of them. So, playing around with an old DVD, it hit her that it would even be better to use a DVD case as the cover can hold the print of your stamps as well. And here there is the full collection of unmounted stamps. For more info and work by Kim Sonksen click here. Sarah found some popper wallets (1) in portrait style at staples - perfect size (A5)! Then, Sarah put the stamps onto the clear storage sheet (2) that they come with and trimmed the printed carrier sheet a little. The stamps also cling easily to the back of the laminate sheet when done also. Then took some plain A5 paper and also trimmed this a little. The reason why you need to trim it is so that the edges have a good seal around the plastic carrier sheet and the laminate. Sarah then laminated (3) the printed sheet backed onto paper. All of this bits go into the popper wallet. Stored in a basket!! (4) The wallets make storage more portable and also more secure. You can see Sarah's work here. 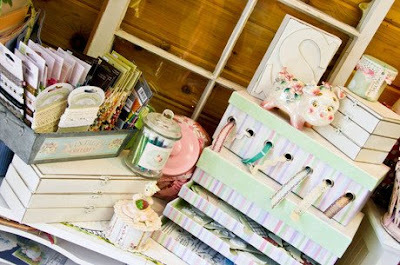 I love pretty storage although I prefer practical ones. 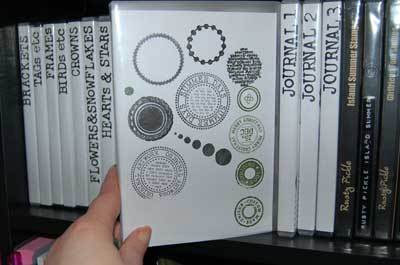 But If you would like some of the pretty ones, Melissa Frances, a canadian scrapbooking company, does it beautiful. 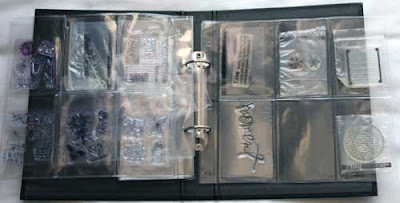 The storage idea came about as I was tidying up the craft room one day and found the packet of the ATC holders. Having been really fed up with searching through the box for the right packet of stamps, the Studio G packets are rather small, I suddenly realized that they would fit nicely in these ATC folders - so much easier now to see them and takes far less room than a box ! 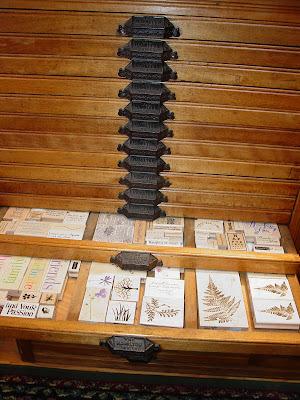 Lisa uses an antique printer's cabinet that stores all her rubber stamps. Click here for a nice idea on how to store the nestabilities by Emily Giovanni. I had an idea when I was cleaning my scrapdesk one day. 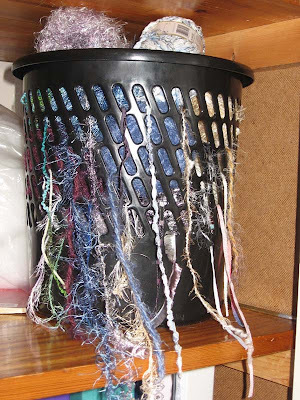 I took my wastebasket and filled it with my balls of yarn. I now have all my balls of yarn in one place and can easily pull out the amount of yarn that I need. Of course I had to buy a new wastebasket, but I didn't mind beeing so pleased with my "invention".